I came to Norway again this year, this time for the 6th annual Trondheim Carbon Capture and Storage (or Sequestration, depending on who you ask) Conference. At least, that was the official reason for coming back to Norway. But that official reason means I can have a more important unofficial reason – see some of Norway with my friend Mark (specifically, Lofoten), then go back with him to Switzerland and see some of Switzerland! Mark took a good chunk of vacation time for this trip and drove his company car (a newish Audi A4 Quattro wagon) up from Switzerland. He blitzed it and drove straight through, sleeping on the ferry across the Skagen Channel then drove straight up to Trondheim. Meanwhile, I wrapped up my school/work related things and got ready to leave the apartment hotel. The people who ran the apartment hotel were nice enough to let me stay in it beyond the checkout time, just asking I not mess it up after they had cleaned and prepared it for the next guests. Well, Mark arrived, and after geeking out to see each other, there was a mutual agreement he should bathe. After a blitzkreig of driving for 16hrs or so, he was, um, not so fresh and the prospect of driving northwards already smelling was not an appealing one. I packed up the car while he un-funked. He had arrived around 5pm and we had no place to stay in Trondheim overnight. 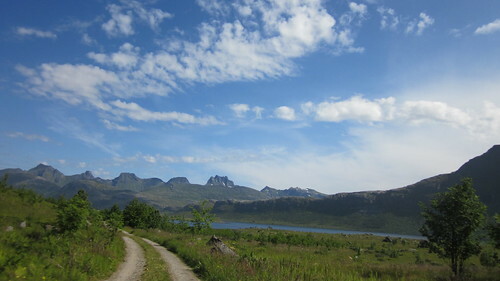 The way I saw it, we either started driving north to Lofoten right away, or somehow campout near Trondheim. But, before our imminent northward voyage, we decided that he needed a break from being in the car, and I needed to shift gears out of school mode. School mode generally leaves me grumpy and annoyed, so to get out of my funk, we toured Trondheim a bit. Some buildings on the river in Trondheim. You can see how high the water gets when the tide comes in. Trondheim is a neat little city; the 3rd largest in Norway (which isn't really that big). It was founded over a thousand years ago by the Vikings, and used as an outpost, capital, and seat of the Archdioceses of Nidaros. The latter is responsible for the Nidaros Cathedral, which can be seen from everywhere in Trondheim and is quite impressive. However, in its current form, the Cathedral is not very old. The original burned, was struck by lightning, burned some more, and generally fell apart by the mid-1800s. Apparently this didn't suit the residents of Trondheim, so around 1869, they started rebuilding it. But these things apparently take time, (I'd also imagine the winters here don't help) and it wasn't finished until 2001. So although it's impressive, I wouldn't call it old. It's more like a new thing that was made to look vintage, extremely vintage. But enough of that and back to the trip. 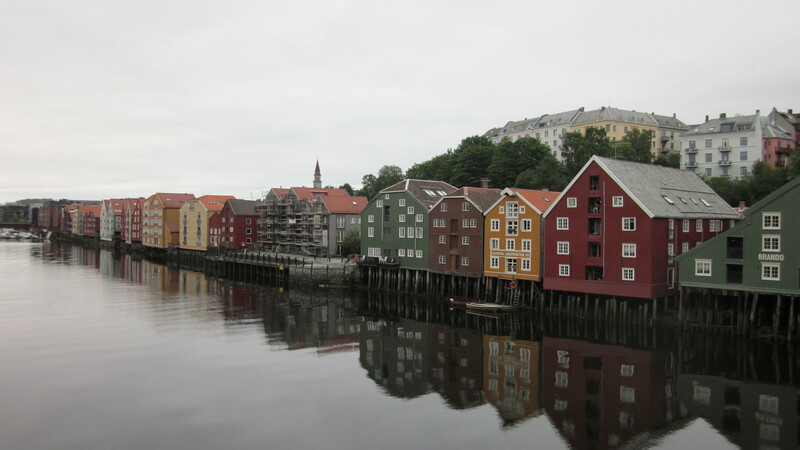 We toured around Trondheim on foot for a few hours, seeing most of what's interesting (and laughing at the Fag School, and how Johan's banken at the Spare bank) and decided it was time to move on. But first, I thought we should stop by some friends from school and check if my climbing equipment had arrived in the mail yet. It was about 10pm when we showed up and knocked on the door, but luckily a party was going on and all was well. We had some drinks and chatted a while, but ultimately decided we needed to get moving (as sleeping there during a party wouldn't work) so said some goodbyes and voyaged onwards, to the north. So we left, at midnight, because it's Norway and light all the time! The drive up is a bit of a blur in my head. There were some suicidal birds that shot in front of the car (and got hit), lots of driving, some snoozing (possibly by both occupants of the car), and a bit of snacking. It's a road trip after all! The coastal road going north. 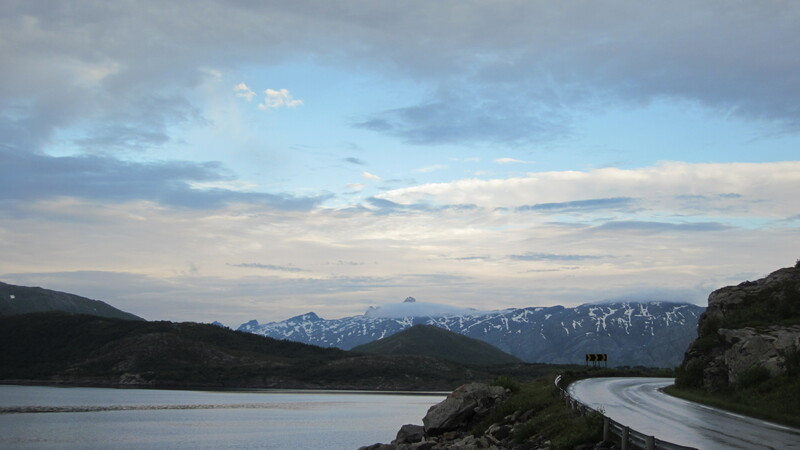 We took the coastal road going north when we could, and drove the long way up to the 'armpit' area of the archipelago Lofoten, took a ferry across, then drove eventually drove into Svolvær. By this time it was really late and we figured we might as well keep going to the first spot we wanted to see - the area around Henninsvær. We found some small pulloff, and setup camp for the night/morning. Unfortunately, although there was little traffic when we pulled in, we soon learned that although Lofoten seemingly is a sleepy area, there sure can be a lot of traffic. So anywho-ha, we awoke and rolled into Henninsvær proper, a small fishing / outdoorsy village (depending on the season) to get some coffee and check out the climbing cafe. We had actually checked it out the night before (since there's daylight all the time) but if we wanted to climb, we needed some gear. Mine had not arrived in the main due to customs (although I had shoes), and Mark didn't have any, figuring he'd just buy what was needed. A whole paycheck later, Mark had gear, and we were off to explore outside of the small village. 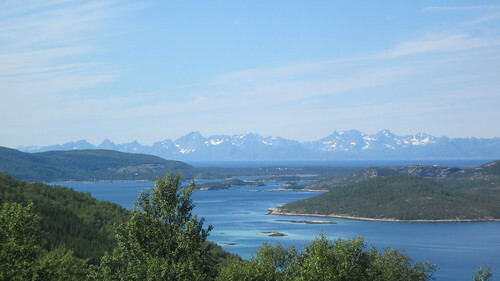 A view towards the mainland from near Henninsvær. 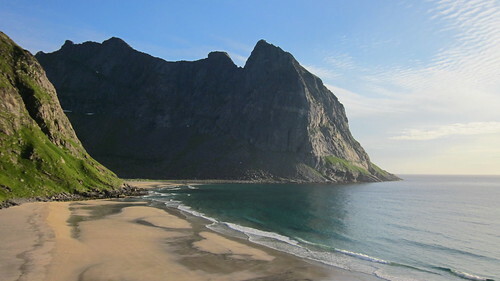 The whole area of Lofoten is actually decently similar to the rest of Norway, it's just that instead of it being a fjord, it's a bunch of mountainous islands (an archipelago) and because it's so far north (and possibly also due to wind), there are very few trees on these islands at higher elevations. Since we were newly arrived and were surrounded by these magnificent mountains, we decided to do a quick climb up one of the mountains near Henninsvær. We had gotten pretty high when I started realizing my worn old shoes didn't have much grip. Mark had no problems, so we split (since he wanted to keep climbing) and I stayed lower and just enjoyed the view. I watched him climb up to near the top and started to think I'd be driving back south alone (and he'd be dead or in a hospital). He disappeared for a while, but reappeared after about 30 minutes and picked his way down. In typical Mark fashion, he acted like it was not a big deal, but revealed later his climb was pretty sketchy. I'm glad I abstained. And about now things get blurry in my memory. You see, when it's sunny 24/7, you have no concept of time. You don't sleep much, because your body is always telling you to be awake. So instead of trying to provide some sort of linear story of what happened and when, I'll let pictures tell the story. The archipelago is pretty long, and we wanted to see all that we could, plus backpack and climb. So here are some pics from places we visited, in vaguely the order we visited them. 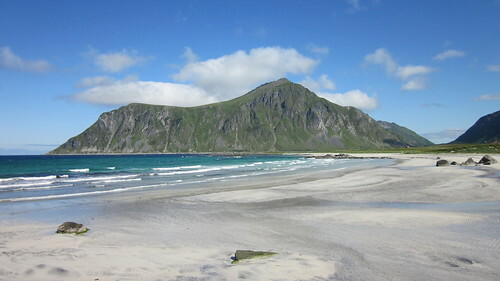 Flakstad: Amazingly epic beach, and not unusual either! 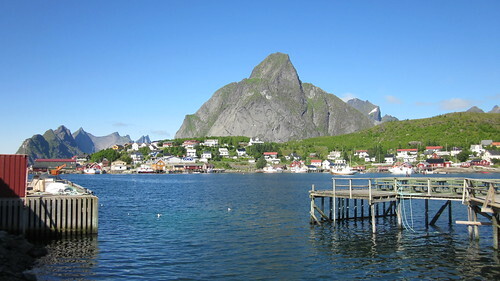 Reine in the south of Lofoten. It's a small and pretty fishing village that's a bit touristy now. A gravel road near the start of the hiking trail to Kvalvika. 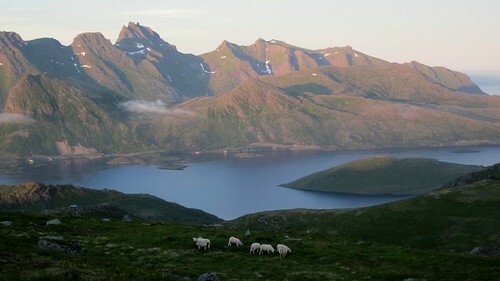 This is pretty typical landscape in Norway. Mark checking pooping motions before our overnighter on Kvalvika. We brought all sorts of climbing things but just ended up bouldering. And no bouldering pads were needed because the grass around the boulders was so soft! 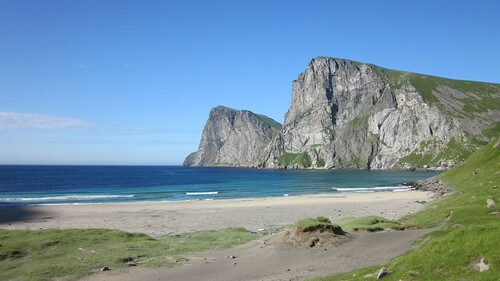 Kvalvika looking south. We jumped in the water after our hike and pitch the tent right above the beach. The water was a bit chilly, but all in all, very nice and refreshing! Climbing above Kvalvika to get a better view around. This picture was taken at about 1am. The tundra is so nice and comfy to walk on, it feel like you're walking across memory foam or a soft bed, but for miles instead of just a few feet! 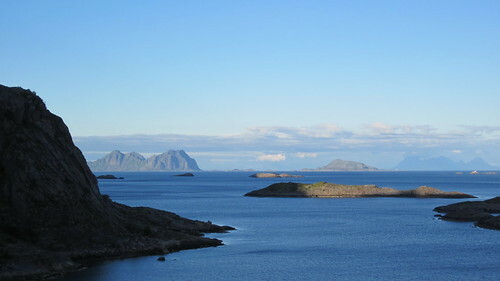 A view of Lofoten from the mainland on our drive back south. It was an awesome experience, but was now followed by a many many hour drive back to Switzerland!